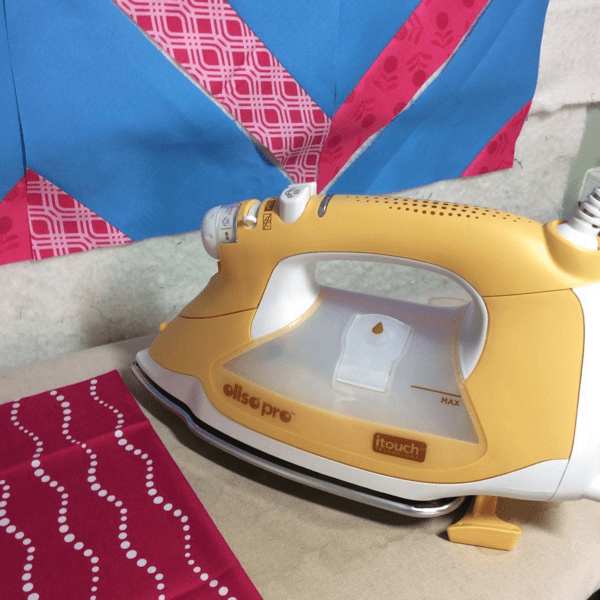 When I went to the first QuiltCon in 2013, the workshop classrooms used a new to me type of iron: an Oliso Pro Smart Iron. Since then, any time I have been in a workshop setting hosted by the MQG, I have been exposed to the unique irons that remain horizontal and retract standing legs when touched. At QuiltCon this year, I stopped by the Oliso booth and saw that they had a blogger partnership sign up form. I really had no idea what to expect, but I signed up and left my business card. Fast forward to a month later, and after several email conversations, I have joined the Oliso Blogger Partnership team and Oliso has sent me their Oliso Pro TG1600 Smart Iron. I was excited to receive an Oliso iron because my previous iron (a Rowenta I had purchased from Joann Fabrics over 5 years ago) has suffered many a fall from my ironing board. As you can see above, The steam selector switch has long since broken off, the front of the iron is cracked (I am so lucky it did not start leaking), and after years of using our local water (hardness: 200), the mineral scale buildup was becoming an issue. I am curious about the longevity of the Auto-Lift iTouch technology, and after realizing that the Oliso irons the MQG uses in their workshops have been shipped around the country and used since 2013 (for QuiltCon and the old SewDown workshops) because I helped unbox them when setting up for QuiltCon this year, I was looking forward to giving it a try. I recorded my opening of the box through Periscope, which you can re-watch through Katch: First Reaction / Use and Box Opening of my New Oliso Iron. Because my local tap water is so hard, I had gone to the grocery store to purchase some filtered water to put in the iron in preparation for the arrival of the iron. The store was out of filtered water at the time (and I was excited), so I bought some distilled water instead. I was rightfully warned through the Periscope comments not to use pure distilled water in the iron. In fact, there is very clear documentation that comes with the iron that says not to use distilled water. Oliso recommends using tap water, but if your local water is very hard (aka full of minerals that will build up mineral deposits in the soleplate vents), Oliso recommends using bottled spring water. I was also pointed to another great article online: Four Myths Regarding Iron Water. After reading the blog post, I have decided to use the filtered water out of my refrigerator. I will definitely report back on how that serves me over time. The Oliso User Manual also suggests to empty the water tank when you are finished ironing. I have to admit that it was awkward the first time I drained the tank back into the fill cup that comes with the iron, but it has since become easier to do. And just like learning anything new, there is a learning curve for remembering to leave the iron horizontal. I found myself setting the iron upright on its base and then quickly remembering to leave it horizontal the first time I used it. Now that it has been a few days, it is much more natural to use the iron as it is intended. One of the things I love the most about the Oliso iron is the length of the cord. At 12 feet long, it is a good 3 feet longer than my previous iron. The short cord length of my old iron was something that caused at least one of the drops or falls. Through Instagram and Periscope, I have already noted a very active user base for the iron and received many wonderful tips and advice that all reads out of the manual. I will definitely be keeping the manual in a safe place (that I can hopefully find later when I need it), as it has a helpful troubleshooting guide and maintenance / cleaning advice, too. And how does it iron? It was an easy transition to start using the Oliso Pro Smart Iron. It has an extended shut-off time (30 minutes), which I have already appreciated. My old iron would auto-shut off after only a few minutes and I would wait for it to warm up any time I was chain piecing. I also appreciate the fill cup that came with the iron; I was able to replace a nice measuring cup back to my kitchen that I had used for years, much to my delight. Good Morning Yvonne! How delightful for you to get this great new iron with all of its benefits. Like you, my iron recently had to be replaced after one fall to many. To bad that it did not wait and happen until after I read this post today, I would have possibly bought one from your link. I hope that you and your new iron become very good “friends” over the next ? years! LOL. Have a fantastic creative day with your fun project! Great review. I love that iron too!! If someone receives an iron with a crack, it should be returned. You don’t want to take any chances with electric appliances that are cracked, it could be a shocking experience. I love my Oliso~I have the 1800 (? it’s orange)~wait til you go to a retreat and you find you leave regular irons down! I like my Oliso too. Now my challenge is to remember to sit a regular iron upright when using it at a guild retreat! I too was wondering about the life expectancy of the up/down feature. Oh cool! Glad you were able to take advantage of this opportunity, that iron is pretty neat. That particular iron is referred to as a “Cookie Making Iron” in my lovely little guild due to it’s full on fanciness. I am happy to say that I treated myself to one almost 2 years ago and am still enjoying it. I love how hot it is, and I, like you, enjoy the long cord. No extension required! Sadly, I have yet to find any cookies in my studio. Perhaps I needed to buy a different model. I’m having problems getting most of the water out, I’m afraid to let any water get on the handle for fear of it getting to the sensors in the handle. Any help here? Thanks. That is a great question. I have decided to get what I can get out easily and then to turn the iron on and press the steam button repeatedly until it is dry. I’ve got that same iron and absolutely love it! I use water right out of the tap. I like the different steam settings on that iron. It’s great. I saw your box opening scope the other day. I’ve used that iron while on retreat before and it’s really nice but so far I’ve not been able to justify the cost. Who knows, one of these days I may pull the trigger. Thanks Yvonne, as I think I need a new iron, and was considering Oliso. You are a great Oliso partner Yvonne. I don’t need a new iron right now (knock on wood) but you have me looking at your iron with great interest. I have this iron in pink and love it. Or loved it…after a year I am having the not so good leaks! I was so hopeful that the money invested in this one would solve the curse of leaks too! Seems I can’t get a way from it! It took a little while getting use to the lift. And once you do…be careful when you use one that doesn’t lift!! Like Jayne, I’ve had this iron for just over a year and am starting to encounter the curse of the leaks, too. I’ve resorted to keeping it dry and using a spray bottle which I think is kind of sad given the cost. Hope you have better luck! my daughter gifted me with this iron a couple of years ago. I use tap water, have some issues with buildup, but not bad. I find that the groove between the metal plate and the top of the iron collects lint that turns really yucky. I will take a q tip and clean up around that groove – when the iron is cold – helps a lot. I just bought a new iron several months ago so not in the market right now. But will keep this one in the back of my just in case. I appreciated this review. I am especially liking the extended shutoff time. My iron shuts off in about 10 minutes. Not nearly long enough. And I love the peek at your bright project. I JUST bought this iron a couple of weeks ago! So far, I really like it. I especially like the 30 minute shut off time. I don’t usually steam iron ( I prefer dry), but I’m trying it with this one. What happens if you yank on the cord when the iron is in its resting position? This looks like a nice iron, but I’m hesitant since I’m afraid that if I don’t have the iron in the ironing board cradle (which I assume this one shouldn’t be placed in) a kid could get scaled if they pull or trip on the cord. Would you not recommend this in a child-ridden home? My iron is starting to look like your old one. One too many drops. Don’t know that I can afford one of these but I’ll keep your review in mind when my next drop finally kills off my current iron. That sounds like a brilliant partnership to have made. I get though irons far too quickly, they just seem to conk out completely on me. And love the peek at your WIP, beautiful blue with those brights. How do you turn this iron on and off? I just purchased a Rowenta that I am returning because I discovered you have to plug it in to turn it on and unplug it to turn it off!